This is a sneak peek at my house. I will post it on facebook when the roof is completed. Take a look to see if you have colored icing, gum paste, confectionery coating, candy writers and candy on hand. 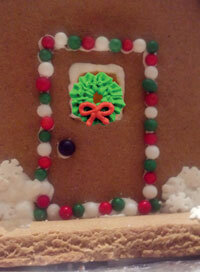 The house starts with Royal Icing (77-101) or Buttercream Icing (77-660) to “glue” your house together. One of the easiest ways to add some elements to your house are sugar layons. In the picture to the left is a wreath (74-28004). Use gum paste or confectionery coating in molds to at dimension to your house. Add Santa, a snowman and a wreath on the door. Make your different by making it a Church. Or make it early and make it haunted. Add candy to your list. (78-23891) can all be used on your gingerbread house.